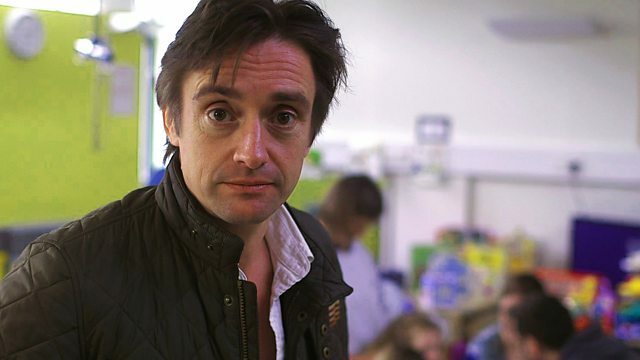 Top Gear presenter Richard Hammond presents an appeal on behalf of The Children's Trust, the UK's leading charity for children with brain injuries. Browse content similar to The Children's Trust. Check below for episodes and series from the same categories and more! Charlie was, to me, perfect. so he was the centre of attention all the time. He was very bubbly. He was alive, you know. We was going to see his grandma and grandad in Spain. ..so I screamed and jumped in. Just praying for them not to take him. I know how suddenly life can change. How one moment everything's fine and the next moment, it's not. and subsequently very highly publicised car crash. I was pulled from the wreckage with extensive brain injuries. but it was a lot tougher for my family. a person needing constant care and long-term rehabilitation. Imagine how much worse that is when it happens to a child. He was blue, he wasn't breathing. We pulled into accident and emergency. Charlie was in a coma for a week and a half. meaning nobody could be sure how he would respond when he came round. and then there's just no response. Really hard. one eye one way, one the other, you know. It was now clear that Charlie had sustained serious brain injuries. We didn't know if he'd ever speak or eat or talk or anything. nobody could give you any answers, and it was really, really lonely. and it's the UK's leading charity for children with brain injuries. and their families have the best life possible. and hydrotherapy, to speech and language therapy. she was keen for Charlie to come and stay. he didn't like being handled, and used to cry constantly. They've worked very hard, especially Belinda, with his physio. She's amazing, she's got him standing. how to do the physio with him. need lifelong care as a result of their brain injury. is also a key part of what goes on here. The Children's Trust is an amazing place. I've learned a lot so when we go home, we'll be OK. THe Children's Trust really makes a difference. and trying to come to terms with a huge change in their lives. Vic Beauvoir has taken care of his grandson, Tom, for most of his life. Three years ago, he received some devastating news. and sirens and things and she said, "Dad, you've got to come quick. "Tom's had a serious accident and they don't expect him to survive." Tom had a major brain injury and spent several hours in surgery. Afterwards, the surgeon told them to prepare for the worst. Just thought, "Oh, my God, please don't die, Tom. "please don't let it happen." until a few weeks later, when they noticed some movement. Oh, I couldn't believe it. just completely as he is on the bed. You know, Tom, but not Tom. and he began to type. so I thought, "All right, Tom," you know, sort of thing. and stop being in the bed all the time just laying there doing nothing. Tom came to the National Rehab Centre weighing only five stone. the benefits of what the dedicated staff here had to offer. and thinking, why can't anything else get better? it felt like I was walking through the air or something. and it was just one of the best days, really. They've definitely given me back my life. I didn't think I'd be able to do anything like this. because of The Children's Trust, so they were a big help. without the Children's Trust. Thank you is never going to be enough. to children like Tom and Charlie, and hundreds of others. that the Trust would like to be able to help. to work with children and their families across the UK. If you haven't got internet access, please call. and the whole £10 goes to the Children's Trust. writing "Children's Trust" on the back of the envelope. Top Gear presenter Richard Hammond presents an appeal on behalf of The Children's Trust, the UK's leading charity for children with brain injuries. This is a condition Richard knows well; when he was pulled from the wreckage of his high-speed car crash, he spent months recovering from a serious head injury. The film features Anne-Marie and her four-year-old son Charlie, whose brain was starved of oxygen when he nearly drowned on a family holiday. Charlie was left with severe disabilities, but Anne-Marie believes he has made the best recovery possible as a result of the rehabilitation, education and therapy provided during his stay at the Children's Trust's specialist residential centre. This has helped the whole family to rebuild their lives.